A Mexican classic made easy at home! 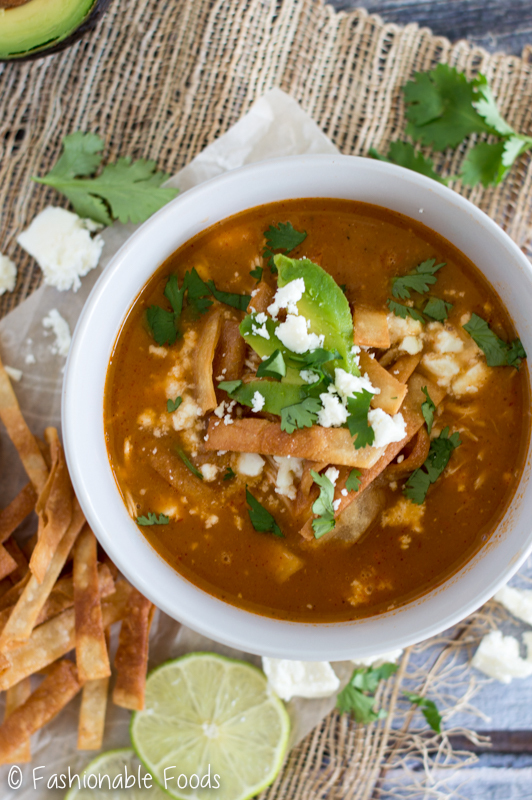 This easy chipotle chicken tortilla soup is the perfect hearty and comforting soup for fall. My version uses chipotle chilies for a nice smoky kick! Happy First Day of Fall! <– I’m not actually that excited. I do enjoy the fall season, but I’m not ready for summer to end. Luckily, it’s still basically summer around here…. and we have a heat wave coming! So, I’ll still be hitting the beach, grilling, and eating tomatoes. Ohhh and guess what? I turned the big 3-0 yesterday! The hubs and celebrated by spending the day in D.C. checking out museums, eating delicious food, and walking around sweating our butts off. The celebration will continue through the weekend, of course. Because who celebrates their birthday for only one day? Not me! ? In celebration of the fall solstice, I have for you one of my favorite soups: chicken tortilla! You all know by now how much I love soup. And I don’t reserve it just for fall and winter. I eat soup all summer long no matter how hot it is! However, a comforting bowl of soup tastes just a little bit better when the weather gets chilly. My all-time favorite soup is chicken noodle. Basic, I know. But, there’s a lot of nostalgia associated with chicken noodle. More on that another time! Anyway, this chipotle chicken tortilla soup is a very close second to my fav chicken noodle. It’s so so so good, and has so much flavor! 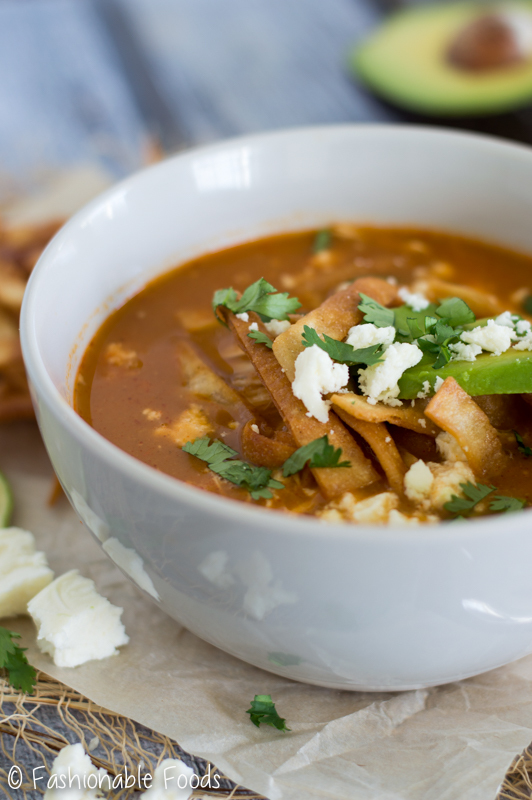 Tortilla soup is a classic Mexican favorite. My version uses chipotle chilis for a nice smoky kick… and because I’m obsessed with chipotle chilis. 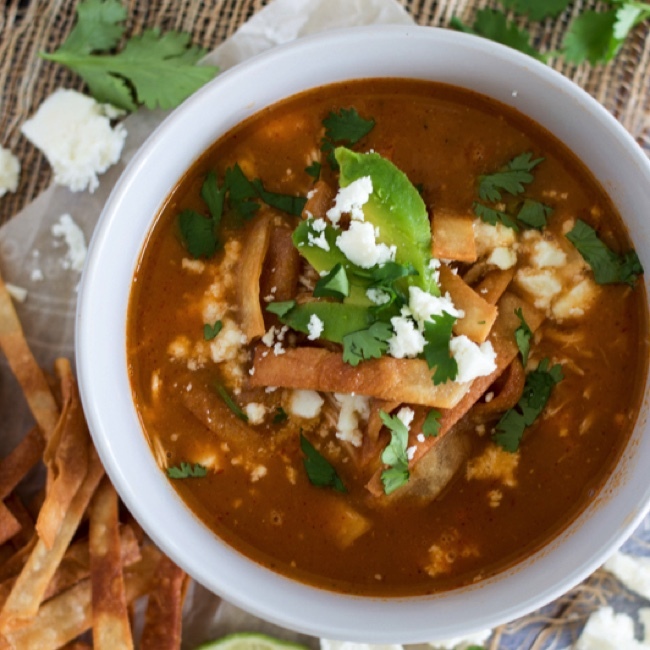 According to my research on classic tortilla soup, the type of chili used depends on what region of Mexico you live, or how your family made it. The secret (in my opinion) to a really perfect tortilla soup is to blend up corn tortillas into the broth. This adds an amazing texture and thickens the soup slightly. Roasting the veggies in the oven is also important to achieve that perfect flavor. Plus, it’s super easy! You just roast it all up and then blend it with chipotle chilis, cilantro, the tortillas, and some lime. Simmer with some chicken broth, add chicken, a bit of chili powder, and your good to go! 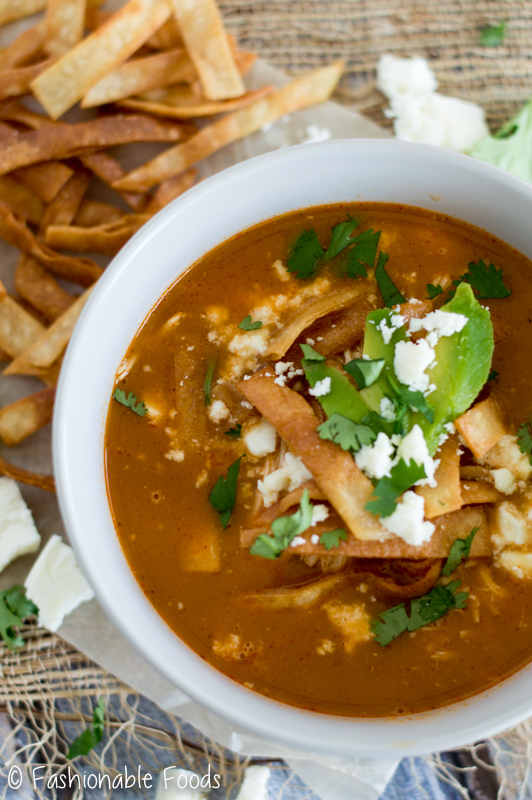 Of course you can’t have chicken tortilla soup without crispy tortillas. This may seem intimidating to make your own, but I promise it’s easy. Just slice up some corn tortillas into strips and fry them in a skillet with oil until crisp. Drain and season with salt. Homemade are SO much better than store-bought. Trust me on this one. 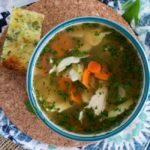 If you really want a great depth of flavor in your soup, I highly recommend homemade chicken broth. I know, I know. You’re thinking this is all far from easy, but I assure you, it really is easy. It just takes a little more time… but it’s mostly hands-off time. All you have to do is cover a whole chicken with water and add some aromatics (onion, carrot, peppercorns). Bring it to a simmer and cook it for about an hour or 2 until the chicken is cooked. Remove the chicken and shred, adding the bones back into the water. Cook for another hour or two, or until the desired flavor is reached. Season well with salt and pepper and you’ve got homemade chicken broth! Plus, you have your chicken needed for the soup, too! I find this step to be easiest because I always keep my freezer stocked with whole chickens. However, if you aren’t wanting to do this, you can easily use your favorite store-bought broth and a rotisserie chicken. No matter how you choose to get to the finished product, you’re going to love it! 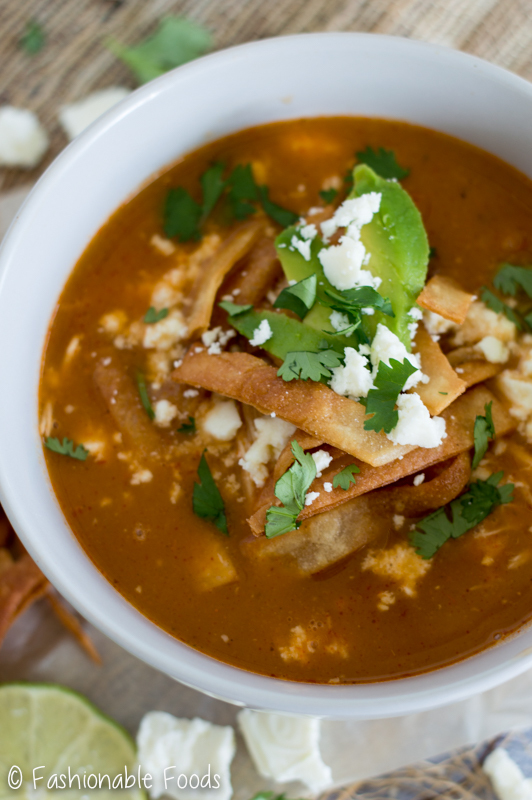 Now, go enjoy fall with a nice big bowl of chipotle chicken tortilla soup! And don’t forget the toppings! Avocado, cheese, cilantro… and of course, the crispy tortilla strips! Have a fab weekend! ✌? Toss the onion, garlic, and tomatoes on a baking sheet. Drizzle with olive oil and season with salt and pepper. Roast the vegetables for 15-20 minutes, or until lightly charred. Add the roasted vegetables into a blender or food processor. Add in the chipotle chilies, corn tortillas, cilantro, lime juice, and 1 cup of the chicken broth. Puree until smooth. Combine the puree with the rest of the chicken broth in a soup pot. Bring to a boil and then reduce the heat to a simmer. Cook the soup for 10 minutes and then stir in the chili powder and taste for seasoning. Add salt and pepper if necessary. Stir in the chicken. Meanwhile, pour enough oil into a skillet to come up about an inch. Heat the oil to 350º. Fry the tortilla strips in batches until golden. Transfer the strips to a baking sheet topped with a cooling rack to drain. Season with salt. Repeat until all the strips are fried. 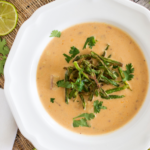 Serve the soup topped with a nice handful of the tortilla strips, avocado, cilantro leaves, and cheese. Finish it off with a squeeze of lime and enjoy! *2 chilies adds a nice amount of heat, if you want it milder use 1. *I recommend homemade chicken broth for the best depth of flavor, but store-bought works just fine. To make an easy homemade broth, grab a whole chicken and cover with water. Add in an onion, carrot, and a few peppercorns. Simmer for an hour or two until the chicken is cooked. Remove the chicken and shred (set aside for the soup! ), and place the bones back into the water. Continue cooking for another hour or so to really intensify the flavor. Season well with salt and pepper. I wasn’t ready for fall either, Keri! I literally thought I was going to throw a hissy fit the other day. Lol. 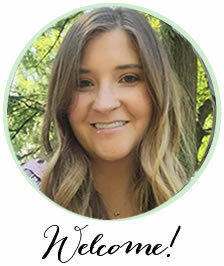 But, now that it’s here I’m looking on the bright side – gorgeous weather, boots, sweaters, and ALL the soups! This chipotle chicken tortilla soup looks amazing! I love anything spicy and Mexican!!! Ill take a gallon please! Cheers! Yay for fall! I’m loving that it’s here (though the weather needs to catch up), but I’m not excited for what comes after it…winter haha! 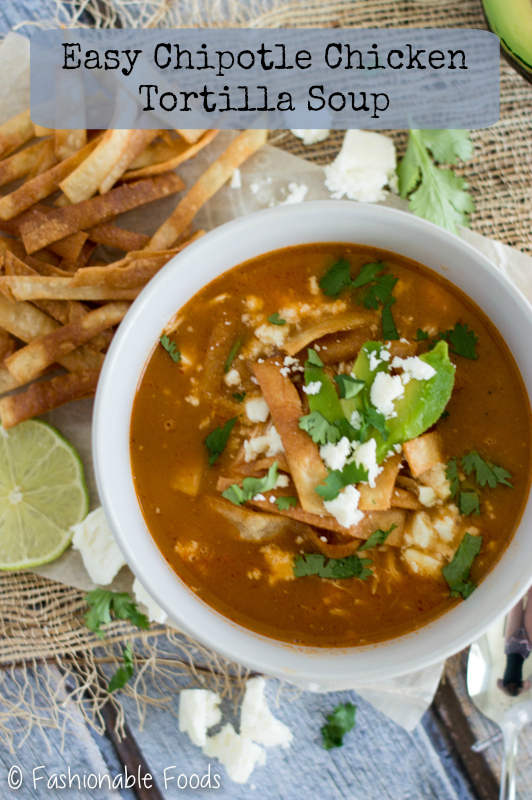 Chicken tortilla soup is one of my favorites and this looks SO good! 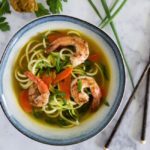 I’m all about soups any time of the year, and this looks fantastic!